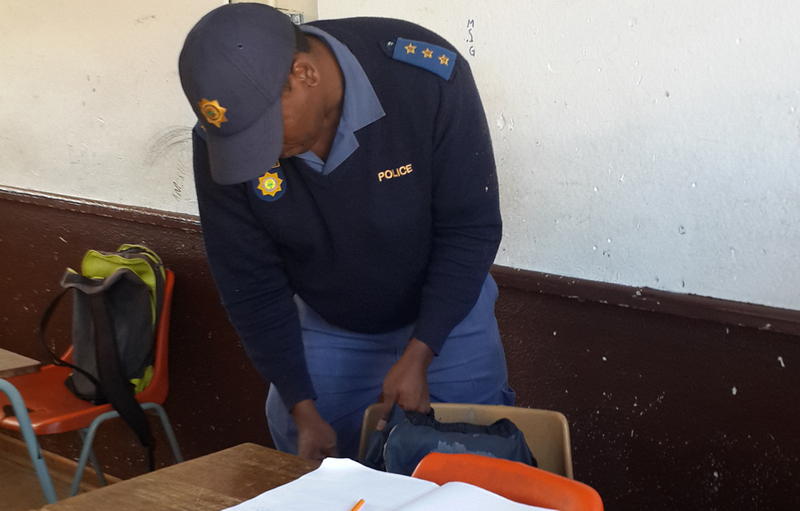 September 5, 2014: Members of the SAPS conduct a bag search for drugs at Westbury Secondary School in Johannesburg. JOHANNESBURG - The Gauteng Education Department wants to transform schools into tech hubs, where pupils use tablets instead of pens and paper. But this ambitious plan has taken a backseat while education officials tackle the gangsterism that is rife in several schools across the province. Police have identified at least 16 gangs operating in Gauteng high schools, and 20 pupils have been expelled. Westbury High School pupils in Johannesburg had a rude awakening on Friday morning. Westbury has been indentified as a gangsterism hot spot, and members of the SAPS&39;s K9 unit conducted a search for drugs on the school&39;s premises -- all in an effort to clean up schools. "It’s not a once off thing (that) we&39;ll be visiting the schools," said SAPS spokesperson, Phumzo Gela. "I was touched to see the pupils found with hookah pipes and dagga, as a parent, not as a police now, because I&39;m also a father, father of five, it is my wish to see kids at schools learning not doing things that are for adults. " Officers confiscated a hookah pipe and dagga from several Grade 9 girls. The SAPS has raided 11 Gauteng schools since June, identifying at least 16 gangs. Drugs, weapons, knives and other sharp instruments have been confiscated. "Other children are playing with computers, our children are playing with dagga. Is it normal, surely not? Other children are learning, we are disrupting because we want to check if they have dagga or weapons, is it normal? Not," said Gauteng Education MEC, Panyaza Lesufi. Pupils have identified local drug dealers who sell to underage users in the area. Police say their operations at schools will continue to the end of the academic year. * Watch the full video report by Narissa Subramoney in the gallery above.